It's been an eventful 24 Hours of Le Mans for the two Gulf-liveried machines that have taken part in the event this year. But, on the occasion of Gulf's 50th year at Le Mans, both cars managed to finish the race. The No.34 Tockwith Motorsport LMP2 Ligier put in a strong showing all through the race, and ended the 24 Hours of Le Mans in 12th place overall. 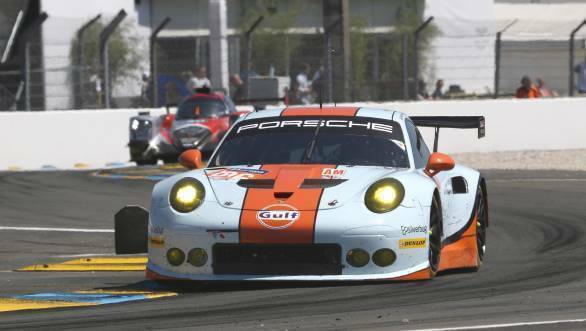 While the No.86 Gulf Racing UK Porsche 911 RSR that was running in the event's GTE category finished 39th overall. Ahead of the race, though, the Tockwith Motorsport outfit wasn't particularly optimistic about their chances at the big race. This, because within the LMP2 category, it had become clear that the Orecas had a clear advantage over the Ligiers. So, when the team qualified 27th overall and 21st in class, it was something that caused one of the team's drivers, Karun Chandhok, some amount of worry. When we asked Karun where he hoped to finish in he race, he'd simply said that he hoped to finish. This was because the team had already had reliability issues, with an electronic fly by wire issue scuppering the team's outing in Qualifying Practice 1. However, the team didn't have to deal with too many issues during the race itself. The driver who went out first was Nigel Moore, who put in a solid performance and managed to move the No.34 Gulf-liveried Tockwith Motorsport machine from 21st in class to 14th in class. Then it was Karun's turn to get behind the wheel. The team sent him out for five long stints in the car, which worked out to 3 hours of driving time. Chandhok managed to retain 14th position in class for the Tockwith outfit. The team's rookie driver, Philip Hanson, also (at age 17) the youngest driver on the grid at Le Mans this year, managed to hold his own. Eventually he handed the car over to Nigel Moore, who soldiered on, putting in lap after lap, getting the car to 12th place overall. Then Karun was enlisted to do the graveyard shift, racing all through the late night hours and wee hours of the morning, having to deal with Le Mans in the dark. He put in well over three hours of racing, having completed a total of 12 stints when he got out of the car. The team was by then in ninth place in the LMP2 category. After that it was once again Hanson's turn behind the wheel, a task he accomplished very well indeed. There was some cause for worry, a brake issue losing the Tockwith Motorsport outfit some time, but with Nigel Moore behind the wheel for the dash to the finish line, the team were still running within the top 10 in the LMP2 class. 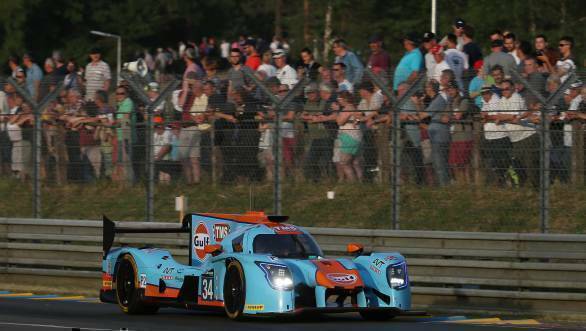 When the racing was over, that is when the chequered flag was waved at the Circuit de la Sarthe the Gulf-liveried Tockwith Motorsport LMP2 Ligier finished 12th overall and 10th in class. On the team's Le Mans debut, that certainly is an impressive way to end one of the most challenging races in the world. Things weren't particularly easy on the Gulf Racing UK team, who, after finishing fifth in the GTE Am category at Le Mans last year, were making their return. However, there had been changes in the team itself, which meant that some of the more experienced personnel were missing this time around. But the team didn't let that faze them one bit, instead they chose to focus on doing the best that they could. A water cooling issue during the second qualifying practice session meant that Ben Barker, the team's fastest driver, ended up in the tyre barriers, which scuppered their hopes of a good race a little. This because the team had to fix the damage on the car as soon as they could, but also because they had to start 59th on a grid of 60 cars. That being said, all three drivers put in strong performances, with the combination of Barker, Nick Foster and Michael Wainwright moving the car through the order all through the race. This meant that they eventually made up 20 places from their original starting position by the end of the race. The team finished 39th overall and 10th in class.